The Electric Puha Band, Waitangi Treaty Grounds, Waitangi Day, 1998. L to R, Te Reo Hau, John Donoghue, Richard Rua Mason, Chris Peirce. RICHARD RUA MASON AND INNUMEROUS OTHERS. 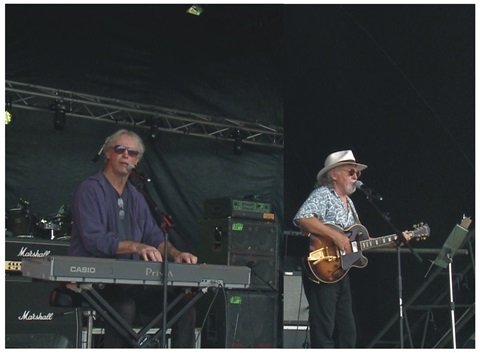 When the final version of Cockroach disbanded following the !981 Nambassa Festival, Richard Rua Mason reformed the band into a three piece working unit with Derek Barnston on bass and Brent Andrews on drums. Rebranding themselves "The Rockcoach Experience" and definitely the "right band at the right time," Rockcoach soon built up a wide fan base right around Northland. In 1984 they reached the national finals of a Television Talent Quest named "Starquest," performing Richard's original composition "Sweet Music in Te Hapua." 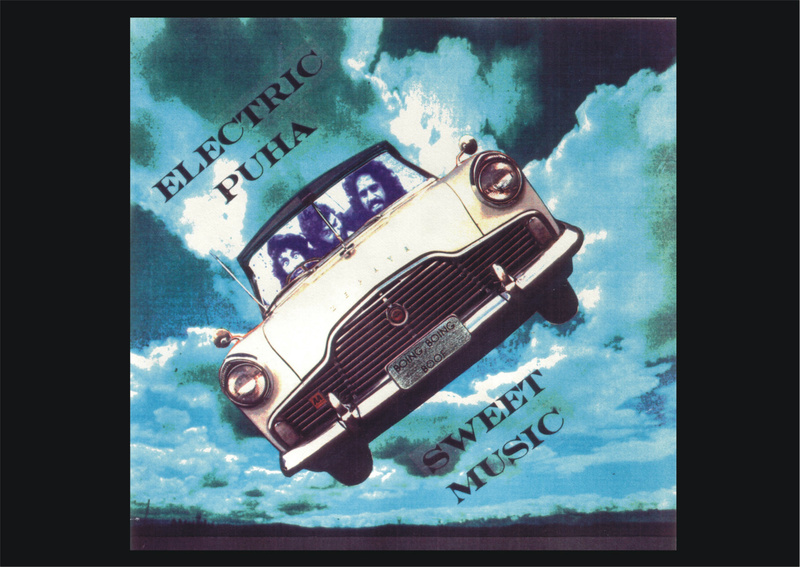 In 1985 the band changed it's name to "Electric Puha" and entered Zemer Studios in Whangarei to record an EP. I was recruited as Record Producer for the project and contributed guitar as well. The EP featured four original songs; - "Sweet Music in Te Hapua," "Love ya Mama," "Kapai" and "Tahiti." I took the master tapes to Wellington to mix and master at Crescendo Studios. I applied to NZ on Air for post-production funding and was turned down. Meanwhile, back in Northland and unbeknownst to me, Richard had given a rough demo-tape of the recording away to friends who took in to Radio Aotearoa in Auckland. Aotearoa Radio Network then duplicated it and sent it out to all their Stations with instructions to put it on the high rotate playlist. The song went on to became Aotearoa Network's "Number One Record for Airplay 1990," while back in Wellington the mastertapes were still under lock and key at Crescendo while the studios waited for its bill to be paid. This was to give "Sweet Music in Te Hapua" the dubious distinction of being New Zealand's first record to become a number one before actually being released. A long, painful search for funds followed and the record was finally released as an EP in 1990. In the Spring of 1993, following the disbandment of Johnny and the Skyhawks, I returned to Northland and joined the Electric Puha Band. From tiny seeds mighty puha grows, and the quartet had now somehow become a loud, thrash-metal rockband, churning out covers of Led Zep, ZZ Top, AC / DC, Motorhead et al. The band had also become a favourite of the Northland Gangs, and over the next few years, was to perform for Black Power, Mongrel Mob, Hells Angels, Roadrunners and the Tribesmen, to name but a few. Eventually, by special request, we performed for them all under one roof, at a Xmas Concert inside Paremoremo Maximum Security Prison. Another version of the band, featuring Richard on guitar, myself on bass and Ned Pukeroa on drums, chugged along behind the scenes as a solid-working three-piece combo, gigging out the twilight years of the great Northland Pub Circuit. 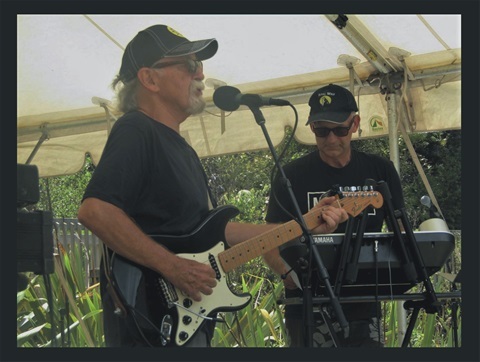 With the great Northland Pub Circuit finally going the way of the Moa, the "Electric" Puha Band played it's last gig at the Kohukohu Hotel, on the Hokianga Harbour, on New Years Eve, 2001. The late Richard Rua Mason's composition,"Sweet Music in Te Hapua" is a bona fide Kiwi Classic. Although relatively unknown among mainsteam New Zealand, this will change over time. Every Maori Radio Station belts out this song and will continue to do so for generations to come. Puha Bandidos Acoustic Streetband, Avarua Market, Rarotonga, 2004. L to R, Dimitri Edmonds, Dave Gorrie, Richard Rua Mason, Al Quinn, John Donoghue. ACOUSTIC GUITARS: Richard Rua Mason, Dave Gorrie, Ivo Yelovich. SAX / CLARINET/ PENNY WHISTLE: Chris Peirce. TEA-CHEST BASS: Dimitri Edmonds, Adrien Ruka. RHYTHM STICK: Al Quinn, Te Reo Hau, Ned Pukeroa, Peter Rihia, RJ Mason, Rick Curry, Paul Godden, Bevan O'Brien. When I arrived in Whangarei in the spring of 1993, Richard Rua Mason and I immediately formed a duo to work at Whangarei's Big Fresh Supermarket. The gig required us to sit up in the ceiling, where we soon discovered that customers could hear us but not see us. To become visible we took to wearing two giant Mexican Sombreros. Perched up in the roof looking like a pair of scruffy old crows we named our duo "Heckle and Jeckle." Local restauranteur Reva Merrideth heard us performing at the supermarket and booked us to play in her restaurant. When she saw us turning up to play in our sombreros, Reva declared we looked like "..a couple of Bandidos...!" The name stuck and the act became "The Bandidos" from then on. We became the resident act at Reva's popular waterfront restaurant and began picking up weekend work, first around Whangarei and then all around Northland. The demand for an all-acoustic band in Northland was surprising. 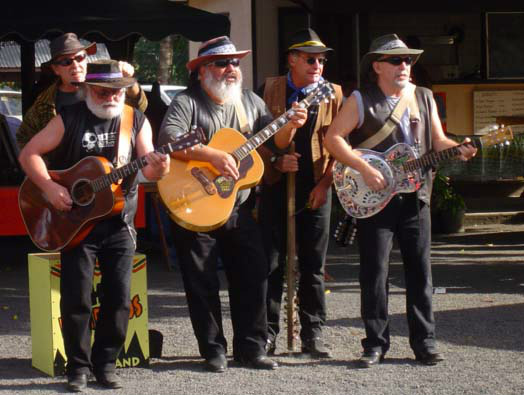 Following the 1995 Bulldog's Reunion Tour, we had to start roping in members of the Electric Puha Band armed with various skiffle-type instruments to help out on the larger Northland festivals and events. With the two bands merging, this lineup then became known as the "Puha" Bandidos. At the 1995 Russell Oyster Festival we met Guiseppe DePlonk, a solo performer who specialised in fire-eating, sword-swallowing, knife-throwing and Juggling. Guiseppe also had a background in Skiffle Music and joined the band as Washboard Player. We orchestrated Guiseppe's wild circus skills to our live acoustic "Jugband" music. This brought an exciting new visual dimension to the streetband. Before long our circle of gigs went as far North as Kaitaia and as far South as Auckland, where we performed in several arts festivals and two Queen Street Parades. Later the same year we flew to Wellington to compete in an episode of TV's "The Gong Show." Although we won our segment, the performance was not without incident. Guiseppe inflicted grossly expensive damage with his throwing knives and the band almost burned the TV studio down with the fire-eating act. By late 1996 the trail of chaos, fire-damage and general destruction was becoming too costly and Richard and I had to regretfully disband the first streetband. We reformed the Bandidos into a much tamer Pianoband that included Wellington sax player Chris Peirce from the Skyhawks. Chris soon established a fanbase of his own and the Pianoband then worked steadily around Northland until the end of the decade. 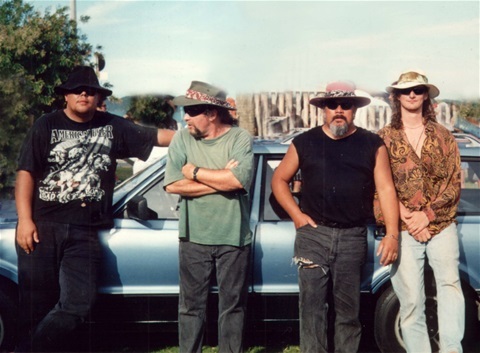 In 2001 I moved to the Hokianga and a five-piece Puha Bandidos Acoustic Streetband was reformed for a residency at the Cobblestone Mall, in Kerikeri. The new lineup featured West Coaster Allan (Sticky) Quinn, as well as two old soldiers who were around at the early days of Cockroach, Dimitri (Bear) Edmonds and Dave (Guru) Gorrie. This band was to make its headquarters in the Bay of Islands and would prove to be the most stable of all the Puha Bandido lineups. Once again the Streetband's roving ground increased, this time as far South as Christchurch and as far North as Rarotonga, where the band mounted a highly successfull two week tour in 2004. The great Puha adventure was to come to an end when Richard Rua Mason sadly passed away in 2006. Various lineups of the Streetband were formed here and there until finally the Puha Bandidos officially called it a day at Kerikeri on 23rd December, 2012. Richard Rua Mason and myself had also kicked off the "Live at Waitangi" sets together, first performing on the Treaty Grounds as a duo in 1996. Over the years various lineups of the Puha Bandidos helped us out, but by 2006, the year of his passing, Richard and I were back to performing at Waitangi as a duo again. I continued on briefly with the streetband, but since 2010 have been appearing solo at Waitangi each Waitangi Day performing my own Timberjack Donoghue material with occasional featured guests. 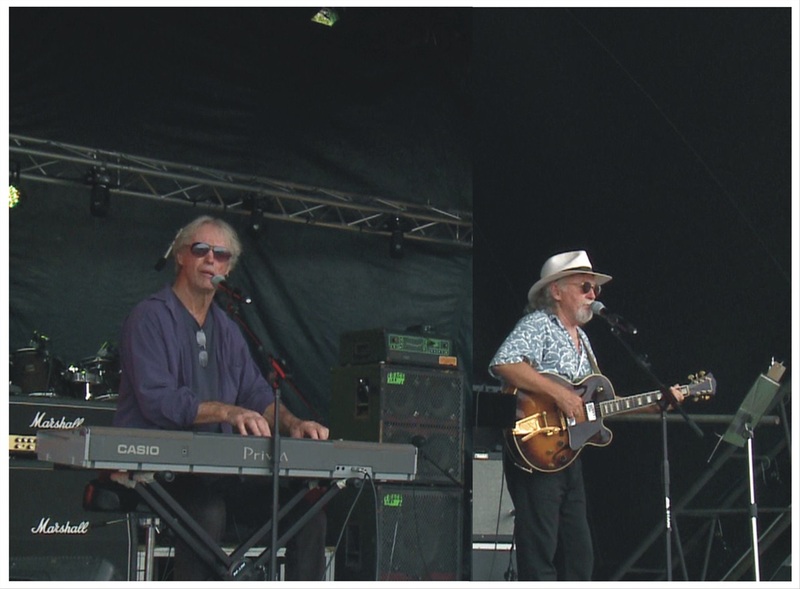 Wayne Mason (L) and John Donoghue (R) performing on the mainstage at the 2014 Ngapuhi Festival. By the mid-1980's, Wayne Mason and I found ourselves seemingly the last 1960's musicians still attempting to make a living from rock music in Wellington. At the time I was touring the urban and regional rock circuits with the Mangaweka Bluesband and Wayne was working the same circuits performing original material with his band "Two Armed Men." We would often meet up loading in and out of the same venues. With the formation of the Crookstrait Bluesband in 1984 Wayne and I were able to compare notes. We concluded that a working duo might provide an answer to our mutual rent-paying woes by promising work outside the friday and saturday band nights. It didn't take long for the new project to surpass all our expectations as a rent-payer. By mid-1985 the John Waynes had nailed down three weekly resident gigs in Wellington City - Wednesdays at the Romney Arms, Thursdays at the Cricketers and Sunday evenings at Flanagans. This situation still left friday and saturday nights free, allowing the two of us to continue pursuing our individual rock projects on the weekends. Before long our individual projects began to overlap as well, and by 1986 we were playing together in six separate band projects, but the Warratah's unexpected popularity eventually led to that band becoming a fulltime job, and one by one, we had to give up all our other musical projects. All that is, except our trusty little duo, which managed to not only keep chugging along through all the craziness of the Warratah's early years, but long after I had left the band. Eventually we had to knock the duo's residencies on the head once the Warratah's touring extended offshore, but Wayne and I continued on working together at various projects that included, among other things, soundtracks for Pacific Films, and a nation-wide appearance on television for "The Year of the Family." Following my move back to Northland, Wayne and I stayed in touch. In phone conversations we would discuss the possibility of a project that might cope with the tyranny of distance, but with the two of us now based at opposite ends of the North Island, this proved problematic. John Donoghue, guitar and vocals (L) and Bevan O'Brien, percussion (R) performing as the Timberjack Donoghue Project (TDP) on the Wakastage, Waitangi Treaty Grounds, 6th February, 2019. To have an open platform for my songs at such a special place and on such a special day is a rare priviledge. The sum result of these Waitangi appearances is that "Timberjack Donoghue," buried in the underground since 1975, is now stirring into life again, but this time around not as a persona, but as an art project. At Waitangi 2019, this year's featured guest, northland percussionist Bevan O'Brien and myself performed as "The Timberjack Donoghue Project," and yet another new original song "The Eyes of Jacky Marmon" was added to the TDP's treatyground tracks. This growing group of songs is now a pasomo recording project. Arohanui and stay tuned, folks..